The Photos app of Windows 10 automatically show the slideshow or recent photos or a single photo on the live tile of Photos app on the Start Menu or Start Screen. By default, Windows 10 Photos app displays a slideshow of images found on %UserProfile%\Pictures folder (i.e. C:\Users\username\Pictures), the default image folder, and if enabled, those store in OneDrive on its live tile. 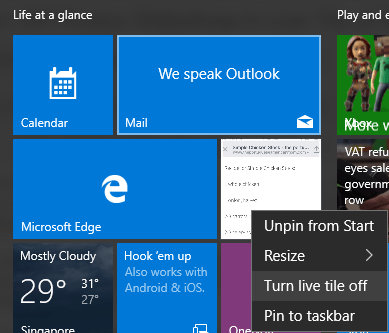 For users who are not fond of showing the pictures slideshow on the live tile of Start Menu or Start Screen, which is prominently displayed to anyone who use the computer, you can easily disable and turn off the live tile from rotating the pictures slideshow. On the Start Menu or Start Screen, right click or tap and hold the Photos tile (the tile which displays the slideshow), and select Turn live tile off. If for some reason the pictures slideshow is not showing in the Photos app tile, and you want it to be displayed, just go to the Start Menu or Start Screen, right click or tap and hold the Photos tile, and select Turn live tile on.